It may come as a surprise to some that North Korea and Russia share a border: 11 land miles of “terrestrial border” and 12 nautical miles of “maritime border”, and during the Japanese occupation in the 1920s–30s, some Koreans escaped to Russia via this route. 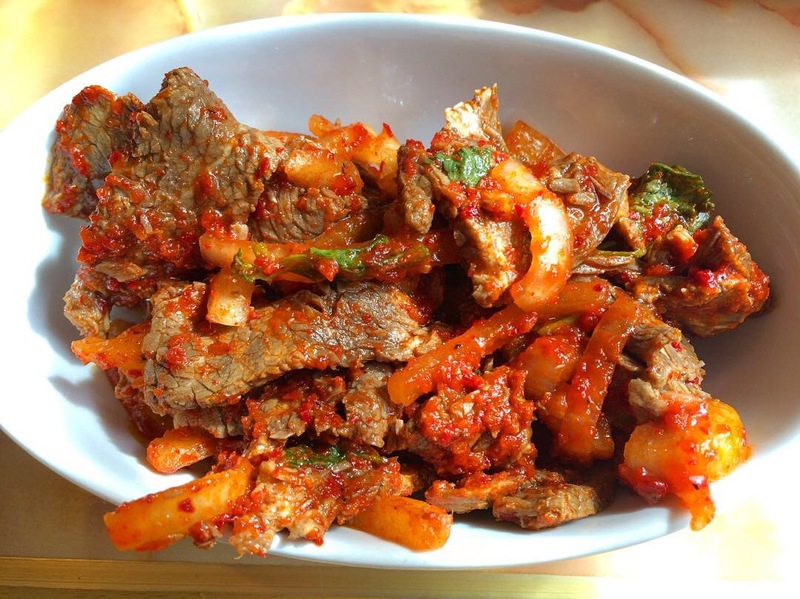 Subsequently, Stalin moved all Koreans in Russia to Central Asia, mostly Uzbekistan and Kazakhstan; they self-identified as Koryo-Saram and their fusion-by-necessity cuisine is the focus of this post. You may have tasted some version of the spicy shredded carrot salad (morkovcha) offered by most Uzbek restaurants but it’s khe that I’ve come to crow about and Café At Your Mother-in-Law, 3071 Brighton 4th St just off Brighton Beach Ave in Brooklyn, does a remarkable job with it. 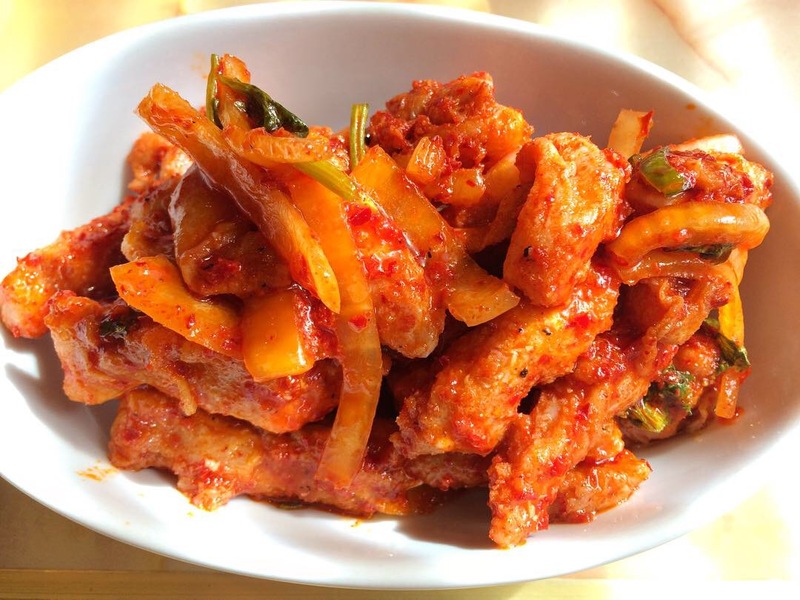 Meaty chunks of raw fish marinated in vinegar, onions and Korean red chili are the main ingredients (recipes vary) in this delectable dish;  a cooked beef version is also available with slightly different seasonings but equally delicious. 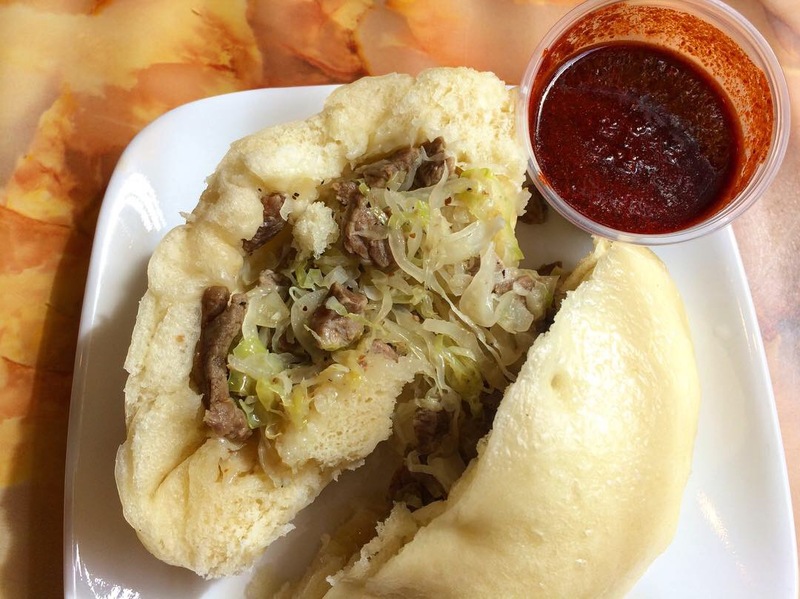 Pegodya, a steamed bun stuffed with cabbage and meat that comes with a special house sauce, makes a good accompaniment. Khe is the reason I take folks to this restaurant on my Little Odessa ethnojunkets and I’m pleased to report that it’s always a hit. I’m also pleased to report, speaking of ethnojunkets, that now you can book a food tour with me at your convenience without waiting for the next one to be announced. During colder weather and the holiday season, I tend to do fewer scheduled ethnojunkets, but that doesn’t mean that I stop doing them! Simply click here to find out how! This entry was posted in Ethnojunkets, Instagram, Restaurants & Food Courts and tagged Russian, Uzbek by Rich. Bookmark the permalink.